Orheiul Vechi Archaeological Landscape is part of the Tentative list of Moldova in order to qualify for inclusion in the World Heritage List. I just got back from a weekend jaunt to Moldova. As previously mentioned, this small country sandwiched between Romania and Ukraine gets few visitors, although, I think the country is actively trying to change this. To get there, we just rented a car for the day which was relatively inexpensive. The area surrounding Orhei is famous for its codrii or old growth forest. The site is located just off the Raut river and it was a very pretty area, even though it was winter and the trees and fields were bare. The limestone and shell cliffs where the monastery is located is pretty spectacular. Entering the 600 year old Pestere Monastaire, the air immediately became hot and humid, the stairs were dark, and it gave the cave a relative feeling of mystery. The monastery itself is one of the most impressing little sites I've ever visited. Only a couple of monks reside there presently, and they were busy at work cleaning the pulpit. We were shown the old monks' cells, the earthquake crack, the stone "balcony" and really enjoyed the history from the head monk. I'm not sure how long the country can maintain the sanctity of this spot, since it is touted as the most important in the country. I hope it is soon inscribed and awarded some funds to try and keep it as much the same as possible. If you happen to be in the vicinity of Moldova, stop by and definitely head to Orheiul Vechi. It really is worth the trip. To read more on Moldova and see plenty of photos, please go to my website at www.reflectionsenroute.com. The Republic of Moldova is not a very touristy place and really has no extraordinary places to offer. (The most touristy part is the Cricova wine cellars - the so called underground city, that - for obvious reasons will not find its way to the WH.) 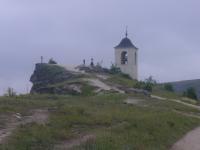 The second most important tourist attraction is Old Orhei (Orheiul Vechi). Theoretically you can visit the site by public transport - but buses to Ivancea are rare, and from there you have to find another bus. We rented a car in Chisinau. The northbound motorway to Orhei and Balti is well signposted. After a half an hour we reached the mountainous region of the Raut river gorge. We knew that the exit to Orhei Vechi must be somewhere here, but to find the actual place was not that easy. We missed the small signboard at least three times - but the local people were helpful and showed the way for the fourth time. (Fortunately almost everybody speaks or at least understands Russian.) Afrter finding the exit everything turned to be easy. Ivancea on the way to the site is a pretty Moldavian village, with all houses painted light blue. After Ivancea we arrived to Orhei Vechi itself. Before crossing the Raut river there is a small visitor center where you can buy the ticket, and leaflets about the site. (English and Russian also available) On the other side there is a small mound. Climbing up you encounter some children trying to sell artefacts or begging some money. On the top there are the churches and the entrance to the main attraction, the cave monasteries. The complex comprises about 30caves, some of them inaccessible without special equipment, arranged in several horizontal rows in the calcareous rock on a portion of about 250 meters. In the calcareous walls of the cells there are many incised signs. The monastery was formed of a nice cave church with an altar, nave, pro-nave and patio, with a impressing number of monastic cells, and a corridor of stairs to the Raut, partly ruined, with a newer tunnel. Next to the steeple, over the cave church on the verge edge of the headland a huge stone cross dated with the XVIII century is installed. The whole conservation area is huge, there are traces of several buildings. A bath, an ancient fortress, and other structures. The ruins are not higher than a meter or so. There is also a small ethnographical museum in the village. The gorge the village, the ruins, the churches are really atmospheric, to walk around, climb the hills and wander around the dirt roads give enough sight for a half or even a whole day if you want to see everything. The way back was much shorter - less than 30 minutes. Though Orhei Vechi is much less scenic than the comparable sites in Romania (monasteries of Moldva, wooden churches of Maramures), it is a must see if you are in Moldova.